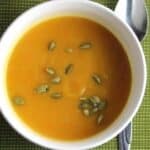 Roasted pumpkins and garlic simmer together and then get pureed for a creamy soup. PREPARE THE PUMPKIN: Use a large, sharp knife to cut off the stem, along with a small circle of the pumpkin. Then slice the pumpkin in half vertically from the stem area to the bottom. Scoop out the seeds with a tablespoon or an ice cream scooper. Use a sharp pairing knife to excise any of the remaining fibery strands that hold the seeds. PREPARE THE GARLIC: Slice about 1/2 inch off the root end of the head of garlic, exposing some of the garlic clovers. Lay the garlic on a piece of aluminum foil. Sprinkle 1 tbsp of the olive oil over the pumpkin flesh and the garlic. Salt and pepper to both the pumpkin and garlic to taste. Wrap the garlic clove tightly with the aluminum. Place the pumpkin halves flesh side down on a baking sheet. Place the garlic alongside the pumpkin. Roast the pumpkin for 30 minutes, until the flesh gets soft and you can piece the pumpkin with a fork. Remove the pumpkin and garlic from the oven to cool. Start cooking the other vegetables after you put the pumpkin in the oven. Heat the remaining tablespoon olive oil in a large pot on medium heat. Add the onions and cook for 5 minutes. Add the carrots and potato. Stir to combine. Stir in the broth and water, and add the bay leaf. Bring the pot to a boil, then reduce to simmer as the pumpkin continues to roast. When the pumpkin has roasted and cooled a bit, scoop the pumpkin flesh into the soup pot. Squeeze out a tablespoon of the roast garlic, add to the soup. Set the remaining roasted garlic aside for other uses. Stir the soup pot to combine the pumpkin with other ingredients. Simmer 5 minutes to let the flavors combine. Puree the soup with a handheld blender. Add the turmeric, paprika, sage, maple syrup and cider vinegar. Stir to combine, heat for another 5 minutes. To serve, scoop the soup into bowls, and top with a sprinkling of the pumpkin seeds. Enjoy!